Angelique Kerber put Germany into their first Fed Cup final in 22 years by beating Australia's Samantha Stosur in Sunday's semi-final in Brisbane. The world number seven fought back from dropping the opening set to beat Stosur 4-6 6-0 6-4 in two hours, 14 minutes to give Germany an unassailable 3-0 lead. 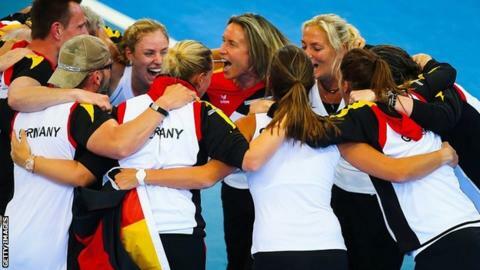 "It means a lot for Germany and it's an honour for all of us," said Kerber. Germany will play the Czech Republic in the final in November, after the hosts beat Italy in Ostrava. The last time Germany reached the Fed Cup final was 1992, when the team of Steffi Graf, Anke Huber and Barbara Rittner (current captain) beat Spain 2-1 in Frankfurt. Leading 2-0 overnight, former Wimbledon champion Petra Kvitova beat Roberta Vinci Vinci 6-3 7-5 to put the Czechs, who won the title in 2011 and 2012, into a 3-0 lead. "I'm happy we've made it and it will be a pleasure for the whole country to host the finals again," said Kvitova. Kerber, 26, had earlier shown great resilience to bounce back from losing the first set against Stosur, winning seven games in a row to turn around the momentum of the match against former US Open champion at the Pat Rafter Arena. It was a second win of the tie for the left-hander, who had earlier beaten Casey Dellacqua 6-1 6-0 after Andrea Petkovic had got Germany off to the ideal start with a 6-1 7-6 (9-7) win over Stosur. Kerber, who was without a win in three previous encounters against Stosur, added: "I knew I had to play my best tennis to beat Sam because she is a Grand Slam champion. "I was a little bit nervous on the last points but now I'm just happy." In Kuala Lumpur, Croatian 17-year-old Donna Vekic beat top seed Dominika Cibulkova to win her first WTA title at the Malaysian Open. Vekic, coached by Briton David Felgate, defeated Australian Open finalist Cibulkova 5-7 7-5 7-6 (7-4), holding her nerve after letting a 5-1 lead slip in the final set. At 17 years, 10 months and 23 days, she is the first player under 18 to win a WTA title since Vania King won Bangkok in 2006 aged 17 years, 8 months and 12 days. "I don't know what to say, I'm so, so happy!" a thrilled Vekic admitted. "It was a very tough match. She played very well throughout the whole match. I was up 5-1 in the third set and she came back out playing insane - so I'm happy I was able to get through in the end."